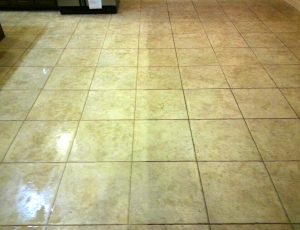 Tile & grout cleaning is one of our specialties at Beyer Carpet Cleaning. Our carpet cleaning technicians are not only experts in carpet cleaning but also tile & grout cleaning. Tile and grout cleaning should not be left in the hands of amateurs. If a company does not use the right equipment or products to clean your tile and grout it could possibly damage your tile and grout. In 99% of all tile & grout cleaning San Antonio a carpet cleaner should never use a carpet cleaning tool. A specific buffer type tool should be used. Using a carpet cleaning tool could damage the tile & grout and could be ineffective. At Beyer Carpet Cleaning San Antonio we only use tools that were designed specifically for tile & grout cleaning and that will have your tile and grout looking like new. Our process is when our tile and grout technicians arrive at your home they will measure and review the tile you want cleaned. Then an alkaline cleanser is sprayed onto the tile and grout and scrubbed into the tile and grout so that all the dirt grease and whatever else is living in the tile and grout will come to the surface for easy removal. We then bring out our tile & grout cleaning buffer that steams and removes the alkaline and junk that was in your tile and grout. Tile and grout isn’t easy to clean and requires hard work but Beyer Carpet Cleaning is always up to the job. Our prices for tile & grout are also the cheapest on the market. 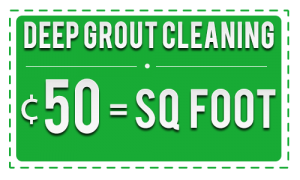 On average Beyer Carpet Cleaning San Antonio only charges $0.50 per square foot. Our price is $0.10 – $0.30 cheaper than the leading competitors in San Antonio. The next time you are in need of tile & grout cleaning San Antonio call Beyer Carpet Cleaning.